Desert Skull is one of the most complex creations to come from Liquella labs. Eight types of tobacco come together for an absolutely unforgettable vaping experience that puts the "t" in "tobacco". 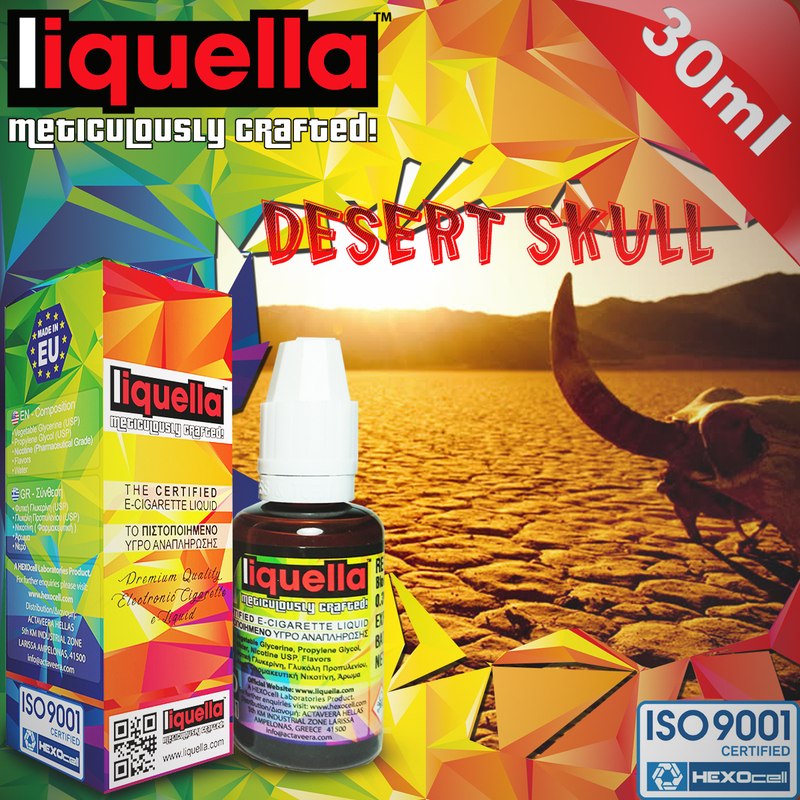 With a foundation built on the critically acclaimed characteristics of bright leaf Virginia and Turkish/Oriental tobacco, Desert Skull is further developed with extracts of burley, shade, perique, latakia, 555 and blond tobaccos. Some are stronger, some milder but every component is in perfect harmony with each other. To make it as rich and robust as possible, Desert Skull is underscored with a pinch of honey and spice. The overall result is a medium-strength tobacco vape with a slightly sweet and spicy feel. Not too dry, nor too moist, the sophistication of Desert Skull can be felt both ways. When inhaling, the flavor is an intense rush bursting with earthy tobacco notes. On the exhale, the vapor soothes your mouth and nasal passage with now-calmer tobacco notes. Chunky white clouds, amazingly accurate flavor delivery and a flawless vape cycle regardless of hardware settings or nicotine levels...you simply can't go wrong with Desert Skull!